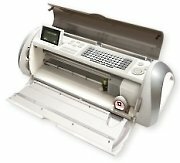 The cricut expression machine is the invention of Robert Workman who collaborated with fellow inventors Jonathan Johnson, Matt Strong and Phil Beffrey to create a product that has generated millions in sales revenues in just a couple of years. Cricut (pronounced cricket) also known as cricut expressions, is an electronic desktop cutting device that resembles a printer. It's a method for electronically cutting-out shapes and images from paper, cardboard and other materials instead of using scissors or bladed hand tools. Robert's company Provo Craft has been supplying craft products to consumers for decades. He believed that a electronic method for cutting shapes from materials would be a solution to the problems of cutting materials by hand. According to the Association of Crafts and Creative Industries, the craft industry has annual sales of 30 billion dollars and a four year compound growth rate of 2.6 percent. Fifty-seven percent of American households participate in crafts spending an average of $476 each year. While school projects account for a substantial share of the craft market, the top selling craft is scrapbooking which has doubled in size over the past few years. Creating Keepsakes Magazine claims that in the United States this hobby has surpassed golf in popularity. One in four households has an occupant participating in scrapbooking compared to one in five households having someone playing golf. "I didn't know anything about electronics. I just knew what my customers wanted. A machine to electronically cut shapes," says Robert. Robert provides some good advice for inventors. He recommends canvassing and listening to customers, "Don't do anything without their input." He suggests inventors should be honest about their strengths and weaknesses, and that they should create a team to develop and commercialize their inventions. "You should record everything you do and thoroughly research your market and competition. The cricut expression machine and it's cricut cartridges dominate the market for electronic cutters because of it's reliability, performance, durability and firmware. Firmware are the program(s) that control electronic devices such as mobile phones, digital cameras etc. and enables the device to operate. Electronic devices cannot function without firmware and it's the reason companies keep this programming code a trade secret. "What you see on the cricut expression machine is patented but it cannot function without the firmware and we keep that a secret," says Robert. To date, no one has been able to duplicate the programming code which is why the cricut expression machine remains the leader in the product category it created. Inventor gets $1.2 million for his idea.